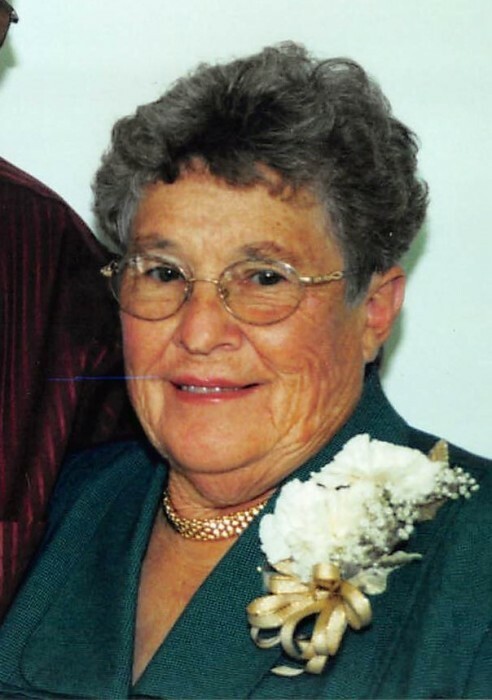 Sara Lou Roberts, of Foxport, went to her eternal home on her 85th birthday, Wednesday morning, February 13th, 2019, at Pioneer Trace Nursing Home while sleeping peacefully. Sara Lou was born February 13th, 1934, in Fleming County to the late LeRoy & Ivy Gilkerson Fearin. She was a God fearing woman who was fully devoted to her family and was a committed member of Pleasant Valley Church of Christ. Throughout her life, Sara Lou worked on their tobacco and cattle farm, and cooked for many years at Sugarloaf Christian Camp. Her passions were bluegrass music, traveling, cooking, camping in their RV, and most of all - her expanding family. If you knew her, you knew of a strong-willed and loving woman with a contagious laugh. She was incredibly hard-working, always making herself busy to take care of her family and others. She is survived by her children, Kirby (Debbie) Roberts, Mike (Marcy) Roberts, Connie (Larry) Bryant and Marty (Cheryl) Roberts; her grandchildren, Travis (Kim) Roberts, Heather (John) Dowdy, Jodi (Winston) Grannis, Leah (Tom) Caskey, Chad (Sarah) Bryant, Rachel Roberts (Joe Wallingford), Rebekah Bryant and Shaina Roberts (Dewayne Gray) ; her great grandchildren Abri, Reece, Kaine & Tatum Roberts, Ava & Titus Caskey, Presley & Cole Dowdy, Marlee & Madelyn Grannis, and Jay & Jonah Bryant. She was preceded in death by her adored husband of 63 years, George “Jody” Roberts; her parents; her sisters, Helen Brown & Lois Hester; and her brothers, L.T. “Buddy”, Stanley, and Martin Fearin. Funeral services will be at 2 p.m., Sunday, February 17th at Pleasant Valley Church of Christ of Foxport with Bro. Tom Mitchell, Bro. Layne Wagner and Bro. Travis Roberts officiating. Burial will follow in Mt. Carmel Cemetery. Visitation will be 5 – 8 p.m., Saturday, at Boone - Nickell Funeral Home and noon until 2 p.m., Sunday, at the church. Travis Roberts, Chad Bryant, John Dowdy, Winston Grannis, Tom Caskey, Joe Wallingford, and Dewayne Gray will serve as pallbearers. Honorary pallbearers are Kaine Roberts, Titus Caskey, Cole Dowdy, Jay and Jonah Bryant. In lieu of flowers donations may be made to Sugarloaf Christian Camp (637 Prater Road, Wallingford, KY 41093). Boone - Nickell Funeral Home is caring for all arrangements for Mrs. Roberts.